All of this is from an article in Outside magazine, with a link at the end of this piece. Thanks, Outside! 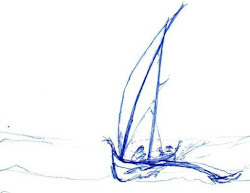 No GPS or weather reports—just a sailboat, the wild open ocean, and the constellations. 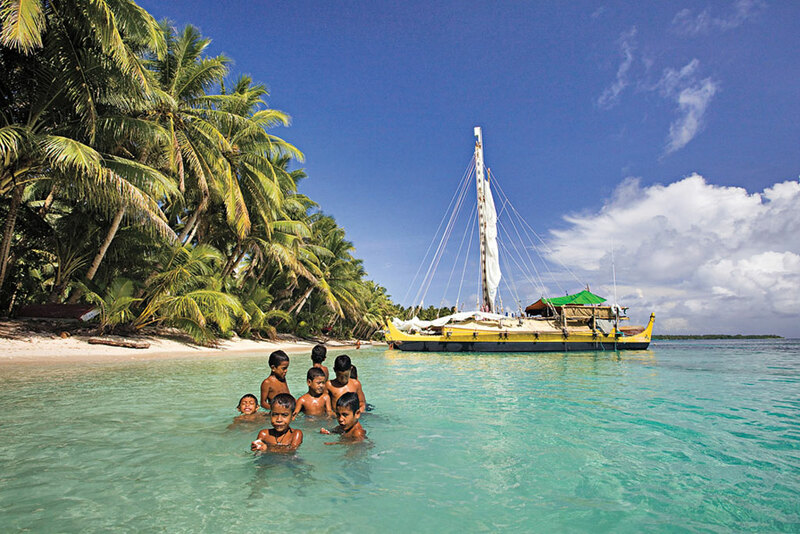 Think you could find your way across the South ­Pacific? 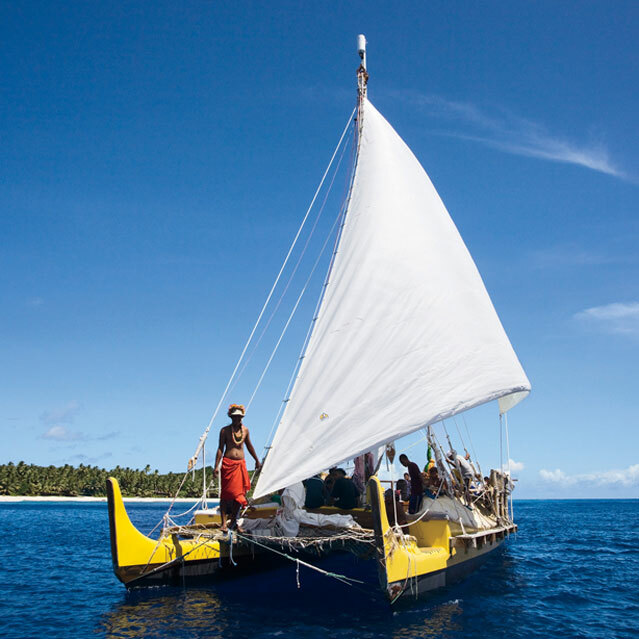 James Campbell rides along with a master navigator in the ­Caroline Islands, where they’ve been sailing this way for thousands of years. It’s 11 P.M., and I’ve just crawled from my bunk for my midnight to 6 A.M. watch. I arrive on deck to hear Sesario order everyone to drop the jib. He has made the decision to ride out a fierce storm with our sails down, what sailors call running under bare poles. 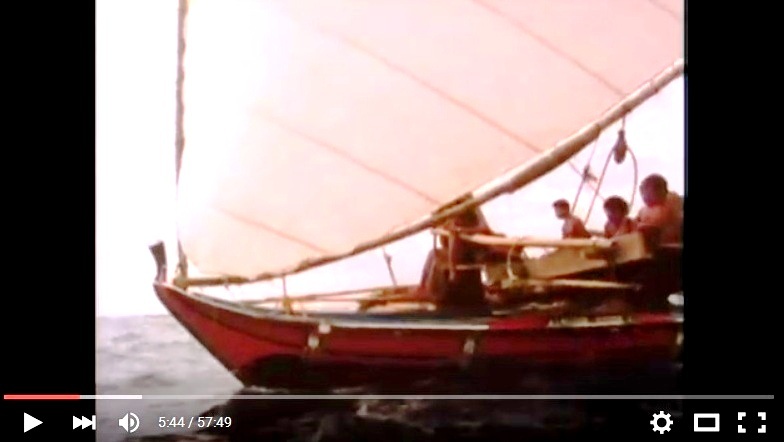 Balancing on a narrow plank in driving rain, two crew members struggle to gather the galloping jib as our boat rises and plummets down 15-foot waves. 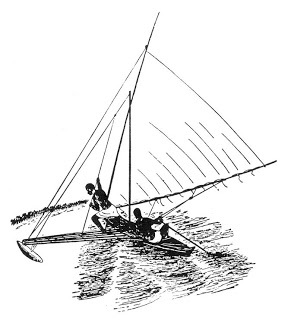 There are no winches and no roller to furl up the sail onto the headstay—only ropes, cleats, and brute strength. As a matter of pride, none of the crew wear life jackets. 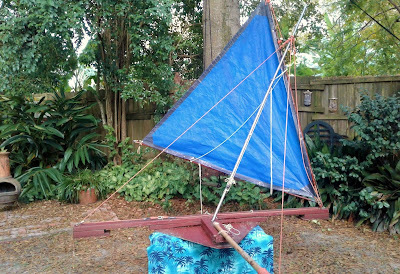 It looks as if the sail is going to get away and the two men will be flung out to sea, but somehow they wrestle it in and tie it off. Tired, wet, and cold, they climb into their hammocks in the tomblike hulls of the Alingano Maisu, our 56-foot catamaran, a modern version of a traditional Hawaiian single-mast, double-hull sailing canoe. There is nothing left to do but rest and hope that our vessel holds up against the howling winds. We’re in the Federated States of Micronesia, in the Caroline Islands, where people say that palu, local master navigators, have magic. 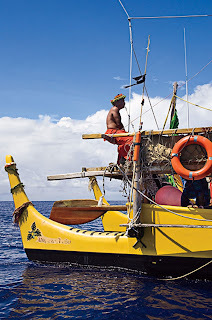 They ply the waters of the Pacific in traditional hand-carved sailing canoes made of mahogany and breadfruit wood and talk to the clouds, currents, seabirds, waves, and, legend has it, ocean spirits, relying largely on the stars as their guide. The Maisu has no GPS unit to plot a course, no radar to help with navigational hazards, no fax machine with daily weather updates, and no satellite uplink for Internet access. 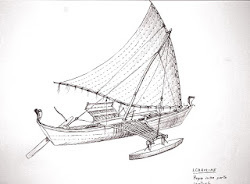 I don’t know if our captain, Sesario Sewralur, a palu and the son of the great Mau Piailug, Micronesia’s most famous navigator, possesses magic or not, but if he does I want him to use it. It’s our sixth night at sea, and malevolent black thunderheads have closed in around us from the north and the east. Earlier in the night, Tony Piailug, Sesario’s brother, did his best to tame the gathering storm. He stood at the rail whispering, chanting, and using his hand as a blade to separate the clouds, summoning whatever powers he’d inherited from his father. But minutes later, a wind began to blow with a predatory moan. Kurt Ngiraked, one of Sesario’s two navigators in training, and I are now alone on deck. Kurt grew up on an island north of the Republic of Palau. He is a huge, craggy-faced, dark-skinned man who rarely speaks and reminds me of the Chief in Ken Kesey’s One Flew Over the Cuckoo’s Nest. 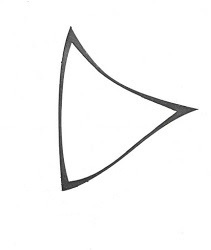 With every star obscured by dark clouds, Sesario has instructed us to hold a compass course. My job is to shine the flashlight so that Kurt, using the 30-foot steering paddle, can point us due east. The blinding rain beats down on us and finds its way under my rain gear. By 3 A.M., the wind has become Homer’s “yelping horror.” After four hours, its freight-train roar has worn me down physically and psychologically. I am soaked and freezing, hanging on to the rail, fearful that I will be blown off the canoe hundreds of miles from help. Kurt, holding the steering paddle firmly, struggles to keep the Maisu parallel with the cresting waves, to prevent them from rolling us. At one point, Sesario opens the flap to his compartment. I crawl over to him. When we left Palau, he put me in charge of the emergency locator beacon without giving me any instructions about when to use it. “Should I press Help?” I yell to him. He cups his hand to his ear, and I yell again. “Not yet,” he answers. Then he zips his canvas cover and disappears. THAT’S THE FIRST time I wonder about the wisdom of our journey. We are sailing across the Pacific via a route Sesario has never taken before, re-creating the exploratory journeys of his ancestors and the ocean’s pioneers. 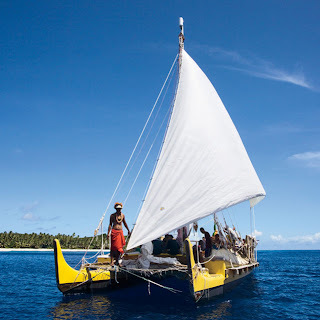 Our goal is to sail a straight-line distance of 800 miles from Koror, an island in Palau, east across the open ocean and through the Caroline Islands, a region of iridescent lagoons, traditional cultures, and untouched white-sand beaches. 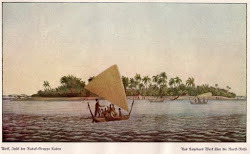 After a stop on Woleai Atoll, we will travel nearly 200 miles east to Sesario’s home, the tiny island of Satawal. Under different circumstances, Sesario wouldn’t use a compass. 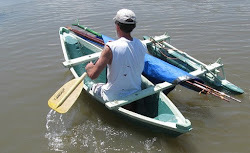 When the Carolinians set off on an open-water adventure, they abide by no schedule. But we are on a quasi-Western timeline, attempting to reach Satawal in 12 days, by mid-April. 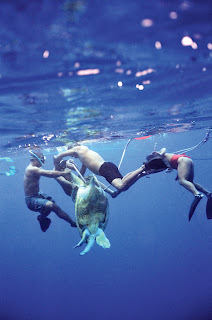 This is normally the season of stable winds and what the Carolinians call voyaging skies, when the islanders return to the ocean to travel up and down the island chain, fishing and hunting sea turtles. It is also a time of wanderlust, when the wind takes possession of young men’s souls. For the Carolinian people, confined to tiny spits of coral, the ocean has always been their grocery and their highway. But it is also their wilderness, a proving ground where young men, like those on Sesario’s crew, test themselves. Stretching 1,800 miles from west to east, the Caroline chain is made up of approximately 600 islands, of which about 80 are inhabited. 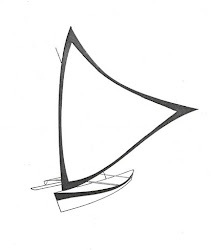 Roughly at its geographic center, Satawal is considered by many to be the heart of open-ocean wayfinding, or star navigation, in which sailors follow a course based on the rising and setting positions of 16 constellations or individual stars. 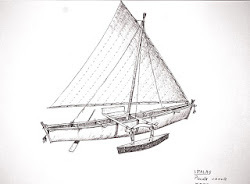 Lying south of Magellan’s 1521 course through Micronesia and the trade routes that followed, Satawal escaped European influence and the magnetic pull of the compass. Later, as the modern world encroached, its navigators kept the tradition of star navigation intact. 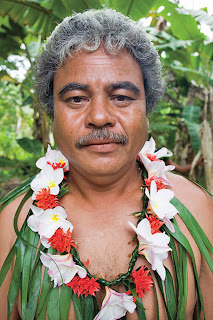 They remained proud outer islanders, re metau, people of the sea. Satawal has produced no greater star navigator than Sesario’s father, Mau Piailug. Mau was six years old when his grandfather began teaching him about the constellations by arranging 32 pieces of coral in a circle to represent the points of the star compass, a demonstration called unfolding the map. Then he explained to Mau how the stars rose in the sky and traveled from east to west. Mau memorized the course of each and eventually learned the paths of more than a hundred. 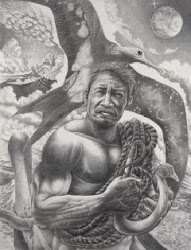 Papa Mau, as he is known on Satawal, was recruited in 1976 by the nascent Honolulu-based Polynesian Voyaging Society to teach its members celestial navigation, an art the Hawaiians had lost five centuries before. Mau guided them in the Hokule‘a, a replica of a traditional eastern Polynesian voyaging canoe, on an exhausting 2,500-mile trip from Hawaii to Tahiti, retracing one of the historic migration routes of Oceania from a time when blue-water sailors in vessels bigger and faster than Captain Cook’s Endeavour explored the unknown Pacific. 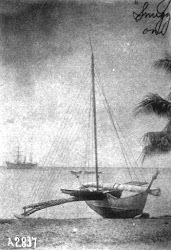 The Hokule‘a—from the Hawaiian name for Arcturus, the star that once led Polynesian canoes north to Hawaii—arrived in Tahiti 34 days later. Seventeen thousand islanders turned out for the reception. 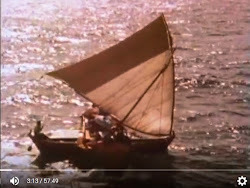 Since then, many more people in the Hawaiian Islands have embraced the traditional ways of sailing, and in 2009, the U.S. Congress earmarked $238,000 to the Polynesian Voyaging Society to continue its efforts to preserve them. 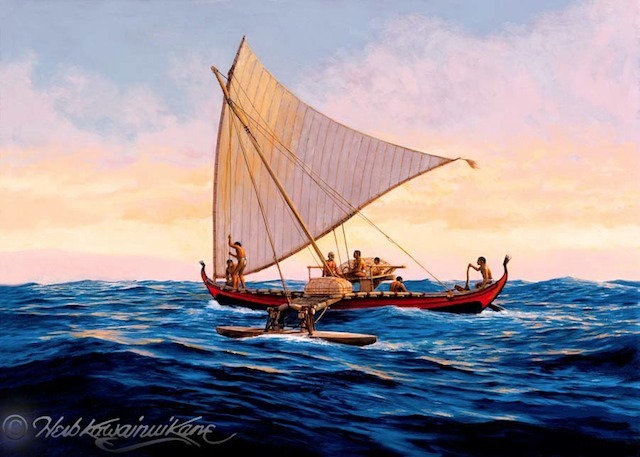 Originally, I’d hoped that Mau or Uurupa, his brother, also an accomplished navigator, would lead our voyage. I’d met 78-year-old Uurupa on a scouting trip to Saipan in 2009, after he’d led a small fleet of sailing canoes 450 miles north from Satawal. But Uurupa’s health was failing, and Mau had died in 2010 after a long battle with diabetes. Mau’s legacy now lies in the hands of his 42-year-old son, our captain. Sesario has five children, a charming wife, and an easy way about him—if there is drinking, dancing, and singing, he’ll likely be in the middle of it. When not on the Maisu or teaching a navigation course at Palau Community College, he does maintenance work for the school. For our journey, Sesario has put together a crew of 12, including photographer Philipp Engelhorn and me. 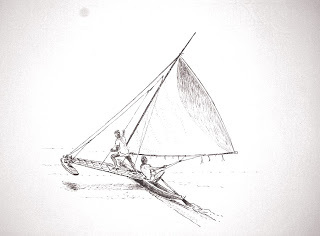 Serving as deckhands are Noah, a young man from the island of Ifalik; Calson, a sweet-natured 20-year-old kid from Palau who has never been at sea; and Peter, David, and Mianu, young men from Satawal who dream of becoming voyagers. 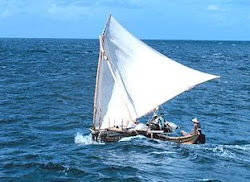 Kurt Ngiraked and Frank Pedro are Sesario’s apprentice navigators, who must study for more than 20 years before being allowed to take a solo voyage. Finally, there is Phillip Sablan, a sculptor and tattoo artist from Guam who is transporting a headstone he carved for Mau’s grave; Kazuyoh Hayashi, a Japanese writer who has been visiting Satawal for seven years and was adopted by Mau’s eldest daughter, who is dying of cancer; and Tony, Sesario’s elder brother, whose resemblance to his father is remarkable. 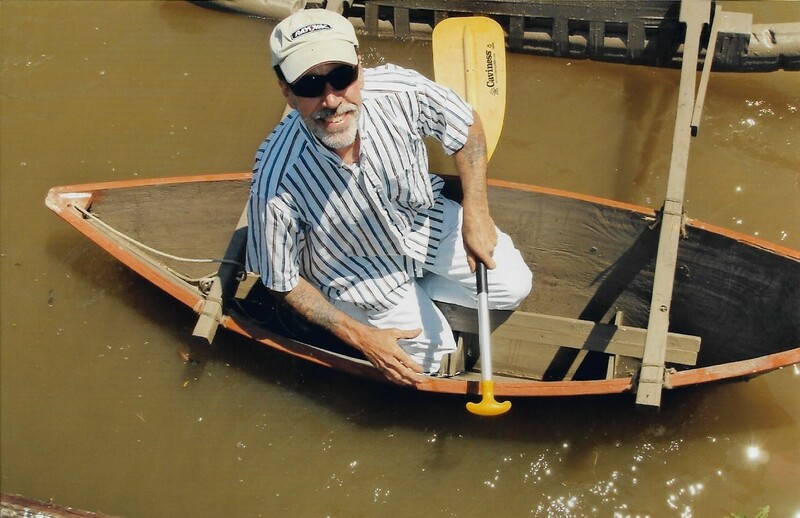 Although Tony is an accomplished navigator, sailor, fisherman, and canoe builder, it is clear who our leader is. 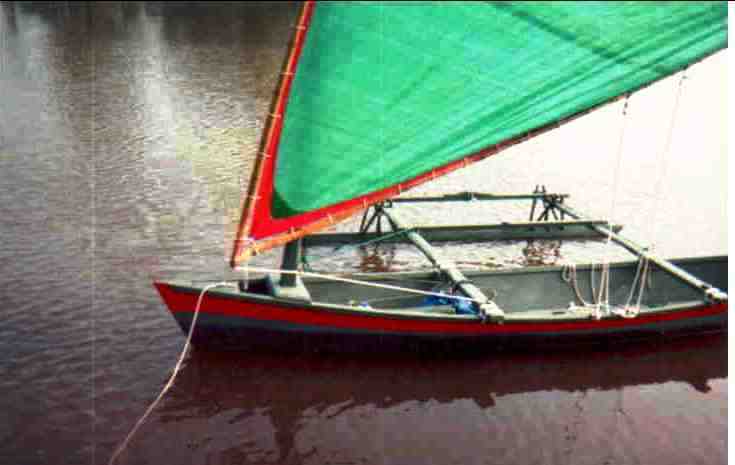 Sesario has dozens of voyages to his credit, including a 45-day, 3,500-mile journey from Hawaii to Satawal in 2007. Like his father, Sesario has undergone the sacred pwo ceremony, a distinction that places him among an exclusive class of star navigators whose ancestors pioneered the remote islands and atolls of Micronesia. Thankfully, he employs this knowledge the morning after the storm. “Big one last night,” he says, sitting on a bucket near the rail. “Yeah, scary,” I say, although what I want to say is “Where were you?” But I keep my mouth shut. On land, navigators pay respect to chiefs, elders, and contemporaries from higher clans, but at sea they are afforded godlike status. The Carolinians also have a superstition about disharmony aboard ship. Dissent can send a crew to a watery grave every bit as fast as high winds and waves. 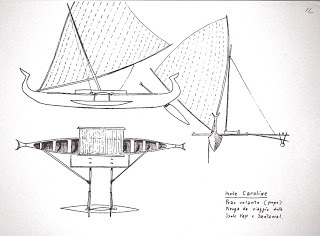 Sesario employs a sophisticated form of dead reckoning using a variety of natural signs—including star paths, reference islands, the shapes and colors of clouds, ocean swells, the sun, the flight paths of birds, and the salinity of the water—to determine his position on the ocean. 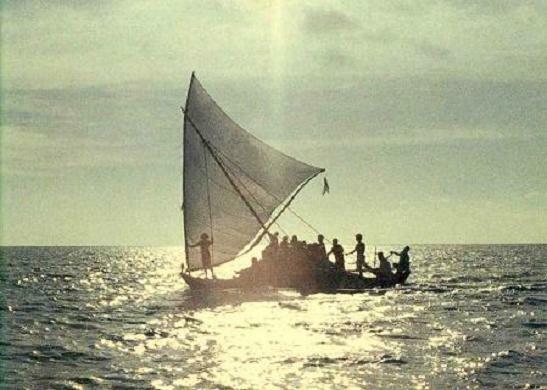 His ability to locate himself at sea is born of intimacy and skills unknown to modern sailors.